Imagine for a moment that Alice, a hacker, was looking at various means for receiving payment for an illicit activity she just undertook. She has two options to do so, which would she choose? (1) Bob built a payment network which was identity-free; it used pseudonyms so no legal identities were required to send transactions between its participants. And that trying to stop or prevent payments was difficult because the computers running the payment network were widely distributed and run by multiple known and unknown participants across dozens of jurisdictions that were sometimes hard to track down. Recourse is difficult and sometimes impossible. Cryptocurrencies such as Bitcoin, Litecoin, and Ethereum are examples of such a network. (2) Carol built a payment network which requires all users to provide a proof-of-identity, usually by scanning and storing of government-issued IDs or utility bills. And that stopping, preventing, or even rolling back payments was possible because the computers running the payment network were run by legally identifiable participants who were often located in easy-to-find offices. Recourse could be cumbersome, but almost always possible. Wire transfer methods like ACH are examples of such a network. Alice would probably choose number one and later try use some conversion tool or exchange to move her payment into number two. How is this done? 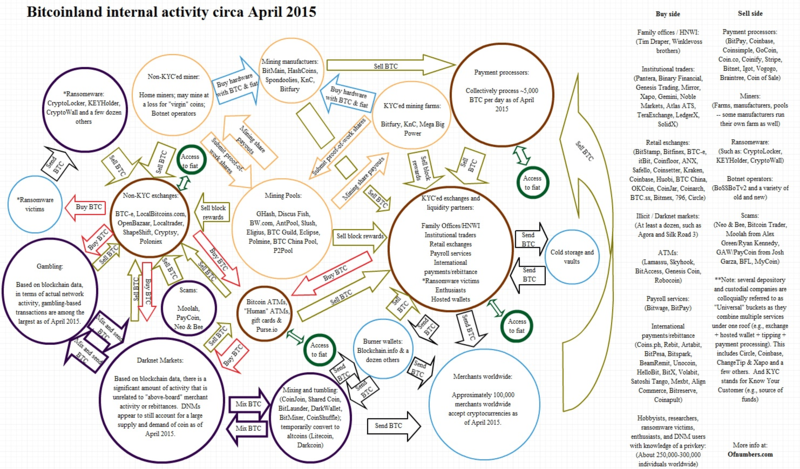 See the (dated) flow-of-funds chart below. For example, data kidnapping – commonly referred to as ransomware – has existed in some form for more than two decades. But the current plight surrounding ransomware, and the white washing of the role cryptocurrencies have in this plight, have gone hand in hand over the past several years. The core characteristics of cryptocurrencies – censorship resistance and pseudonymity – are some of the main reasons why ransomware has become increasingly commonplace. And these cryptocurrencies need liquidity. Liquidity into-and-out of fiat has fluctuated over time, with some exchanges being debanked and sometimes rebanked, but as an aggregate it has increased overall. Liquidity is often done through venture-backed gateways and exchanges. As explored in my previous post, as well as others, many of these gateways and platforms have inadequate and typically non-existent KYC and AML gathering processes. This post won’t go into the details surrounding some of the investors and promoters of these platforms, but further research could dive deeper into that industry as well as the white washing that goes on to distract investigations. We see this empirically: attackers do not ask for fiat or credit cards because these would be easily tracked and/or transactions would be halted. Instead, they ask to be paid in some kind of cryptocurrency because they know the likelihood of getting caught and reprimanded is significantly lower. This past Friday, WannaCry, a ransomware package, wreaked havoc on more than 200,000 victims across all times of organizations located in over 150 countries. This included government services including NHS in the UK and the Interior Ministry in Russia. The first-order of victims ranged from small startups that could quickly patch and restart their computers all the way to large hospital systems that were unable to access patient records and had to turn away patients. While all of the impacted organizations already should have had a formal plan to upgrade and patch these types of vulnerabilities (e.g., create regular back-ups off-site), based on several news stories, many of them did not. Will they all learn from this lesson? Probably not. Last year the FBI estimated that around $1 billion was paid to unlock ransomware and cyber extortion. Cryptocurrencies, such as Bitcoin, were usually the preferred method of payment. Some of our criminal investigators face the challenge of identifying online pedophiles who hide their crimes and identities behind layers of anonymizing technologies, or drug traffickers who use virtual currencies to obscure their transactions. For Bitcoin, there are ways to remain fairly anonymous, like using mixers, however it requires a lot more work to. But relatively few people are investigating, so the chance of getting caught is likely low. Newer cryptocurrencies such as Monero and Zcash are designed to be anonymous which makes them harder to track. Monero has been spotted in the wild alongside the Kirk Ransomware as well as research from Sophos (pdf).3 And Zcash has been used by a botnet to mine more Zcash on devices such as your phone. How to bring some light into the darkness? In terms of the ransomware attack, people/organizations need to do a better job at patching and removing end-of-life systems, clearly. My larger concern is that cryptoviral extortion is the only cryptovirology attack that anyone seems to be paying attention to and there are many, many others. My recent post looking at Bitfinex and regtech was quite popular. It was viewed several thousand times and I received a number of calls from reporters looking to investigate some of the points raised. Some people pointed out that the behavior by Bitfinex and other cryptocurrency exchanges is one of the reasons why a few banks in emerging markets have lost correspondent banking access: that they were de-risked because of what others perceive is a high-risk customer base. Between 2009 and 2016, correspondent banking relationships, where one financial institution provides services on behalf of another in a different location to facilitate cross-border payments, have reduced globally by 25%. Earlier this year, the People’s Bank of China, SAFE and other government bodies in China, investigated and froze cryptocurrency withdrawals at many, if not all, the cryptocurrency exchanges operating on the mainland. Why? Among other reasons: inadequate KYC and AML gathering and sharing processes. According to Caixin, a notice of administrative punishment may be released in June that details the punishment and fines of these China-based exchange operators. In addition to freezing and de-banking, what are some other solutions as well? Companies such as Blockseer and Chainalysis provide tools for law enforcement, regulators, entrepreneurs and compliance teams to trace and track the flow-of-funds on cryptocurrency networks. I have written about them numerous times. Angel List is tracking 96 startups involved in providing compliance-related software for SMB, hospitals, cloud providers, social media platforms and a handful of other verticals. It also has job listings for 11 regulatory compliance startups. There is an additional 2,878 startups listed under the broader category of big data analytics, some of whom who are also working in the regtech space. While technology can help play a role in identifying participants on these types of networks (blockchains and distributed ledgers), it is also worth exploring the proposed strawman for setting up a Kimberley Process for cryptocurrencies. Identity systems are critical to all property rights and financial networks. Creating applications around data lineage, data provenance, KYC management, and standardized digital identities will help provide transparency into all markets. If you’re interested in learning more about these tools and mechanisms, feel free to reach out or leave a comment below. About two years ago I gave a speech discussing the challenges cryptocurrency-related companies have had in creating reliable internal financial controls. How over the span of a few short years the cryptocurrency startup landscape (un)intentionally reinvented the same type of intermediaries, custodians, and depository-like structures that the original creator(s) of Bitcoin wanted to route around but… setup without the oversight, assurances, and accountability you would find required in the traditional brick-and-mortar world. The lack of financial controls and subsequent pitfalls is easily identifiable in the irrational exuberance of the get-rich-quick “initial coin offering” (ICO) world. I’ll save my ICO post for later, but there is one story that is a bit more concrete and easier to understand and involves a company called Bitfinex. Bitfinex, as measured in terms liquidity and volume, is considered the top global cryptocurrency exchange. It is nominally headquartered in Hong Kong, has (had) bank accounts in Taiwan, servers in Europe (Italy? ), operations in San Francisco and a staff around 30 altogether. Above is a speculative corporate structure created back in September 2016 by an internet user by the name of RobotFinance. 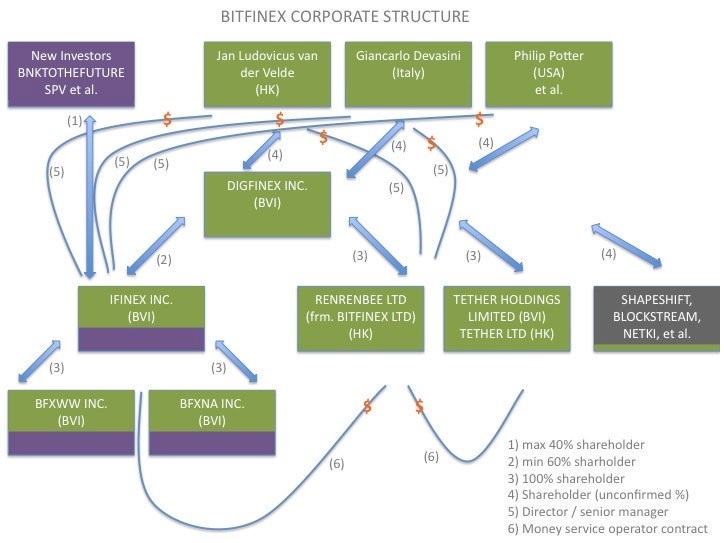 He created it “based on the last annual return of Renrenbee Limited and statements made in the pitch forum.” Unless you are registered as a user with BnkToTheFuture, you cannot view the pitch deck but an alleged copy of the Bitfinex deck can be found here and a discussion of it here.1 These leaked allegedly legitimate documents also suggest that Bitfinex did an equity swap at a $200 million valuation which was based on their financial growth and targets before they lost roughly $65 million in customer assets due to a hack that will be described below. This post is not intended to single out Bitfinex as there are any number of other exchanges and wallet providers that could be looked at as well. Nor is it intended to dive into all of the subsidiaries or even the entire history of the parent company or the cryptocurrency platform. Rather it serves an illustration as to how new technology and financial controls could help increase visibility and transparency for all stakeholders involved thereby reducing the risks for users and retail investors (among others). Last November I published an internal paper that may be released later this year which explored the proposed Winkleovss COIN ETF. In it, I highlighted a detailed history of various cryptocurrency exchange platforms and their colorful pasts, some more sordid than others. Following the second hack, Bitfinex announced a way to compensate its customers. Why did it need to compensate the customers? Because, following the second hack, it socialized the losses, seizing the remaining customer assets and gave nearly all of them a 36% haircut.4 In exchange for giving everyone a haircut, Bitfinex then self-issued two different “tokens” called BFX and then later RRT. These two tokens (or IOUs) effectively enabled Bitfinex to monetize their debt/losses. RRT, the acronym for Recovery Rights Tokens, are opt-in coins issued, “to compensate victims of the security breach and, thereafter, to offer a priority to early BFX token conversions.” It is unclear how many of these coins were issued or how many were redeemed. Prior to this hack, on June 2, 2016, the Commodity Futures Trading Commission announced that it had fined and settled with Bitfinex for offering regulated products without having properly registered to do so. This is important because several vocal Bitcoin proponents have distorted the actual historical events. According to the communications director of Bitfinex last year, “Bitfinex migrated to the BitGo setup before any discussion or anything with the CFTC happened.”8 In other words, this hack was not caused by the CFTC. On April 3, 2017 Bitfinex announced that it was completing the redemption of all BFX tokens and they would all be subsequently destroyed. How did Bitfinex manage to pay off tens of millions of dollars of self-issued debt in a span of less than 8 months? Outside investors, through BnkToTheFuture, exchanged fresh capital in exchange for BFX tokens and equity. And one of the continual challenges in trying to follow this saga is that Bitfinex representatives, co-founders, and investors often post key comments in disparate social media channels across reddit, Twitter, Youtube, WeChat, TeamSpeak, Telegram, and others. For instance, there are several different reddit threads discussing the Tether terms of service involving a co-founder and another one with the general counsel, but this material is not centralized in a way for users to easily follow it all. Tether Limited is also a regulated money service business and has applied to operate in nearly every US state and territory (see above). Based on the information above, tethers are not money or currency and may not necessarily be redeemable for money. What is a stablecoin you ask? Another proposed solution, albeit one that involves similar counterparty risk, is a stablecoin which is a pegged value guaranteed or at least marketed as being pegged on par to a specific exchange rate. The risk in this case is that the exchange operator might not fulfill his or her end of the deal (e.g., abscond with the funds). And tether is no exception. 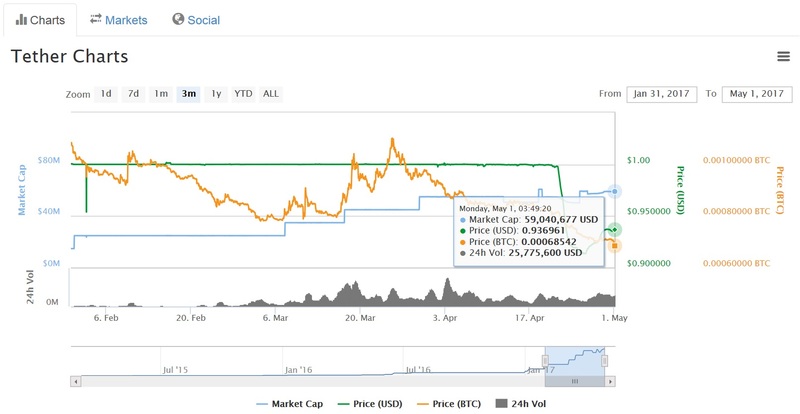 Originally 1 unit of tether was supposed to be equivalent to $1 USD. At the time of this writing it has fallen to $0.93. While Bitfinex has made a few public statements about “pausing” wire transfers, there has been no major public statement explaining the precise nature of the drop in tether price. So a small army of internet users have pieced together a probable theory and it comes back to how Bitfinex operates. Earlier this month, a lawsuit revealed that Bitfinex had sued WellsFargo – who had refused to process their wires and returned the USD-denominated funds – a bank that is integral to its correspondent banking relationships. About a week later Bitfinex withdrew its lawsuit but not before people poured through the documents. In summary we learned that Tether (which is named in the court documents) is a mechanism for enabling cross-border money flows; although we cannot say what the exact purpose was for these money flows is (e.g., pay for college tuition? buying a home? paying for a large order of buttery popcorn?). Over a span of a few months, tens of millions of USD had been wired through WellsFargo into and out of four different banks in Taiwan which Bitfinex, Tether Limited, and other affiliated subsidiaries had commercial bank accounts with. At some point this past March or perhaps earlier, someone on the compliance side of WellsFargo noticed this large flow of USD and for one reason or other (e.g., fell within the guidelines of a “suspicious activity report“? ), placed a hold on the funds. In early April Bitfinex’s parent company, as noted above, filed a lawsuit for WellsFargo to release these funds. But about a week later retracted its suit. According to a recent post from Mark Karpeles, the CEO who helmed Mt. Gox prior to its infamous bankruptcy, these actions set in motion a type of Streisand Effect: the lawsuit became newsworthy on mainstream media sites and consequently other banks — and compliance personnel at other banks — learned about the cryptocurrency exchange called Bitfinex and might (have) become wary of doing business with them. We can only speculate as to all of what happened next, but we do know for certain that the bank accounts Bitfinex and Tether used in Taiwan were either fully terminated and/or unable to withdraw USD from late March until at least the time of this writing. This is not the first time Bitfinex has been “debanked” before. Phil Potter, the CFO of Bitfinex, recently gave an interview and explained that whenever they have lost accounts in the past, they would do a number of things to get re-banked. But this story isn’t about debanking cryptocurrency companies, a topic which could include the likes of Coinbase (which has been debanked multiple times as well). Because there is currently no USD exit for Bitfinex users, a price discrepancy has noticeably grown between it and its peers. The spread between exchanges is typically a good indication of how difficult it is to move into and out of fiat in a country as there are boutique firms that spend all day and night trying to arbitrage that difference. In the case of Bitfinex, the BTC/USD pair now trades at about $50 to $75 higher than other exchanges such as Bitstamp. This ties back into the challenges Mt. Gox users had in early 2014, as the ability to withdraw into fiat disappeared, the market price of bitcoins on Mt. Gox traded at a dramatically different level than other cryptocurrency exchanges. That is not to say that what is happening at Bitfinex is the same thing that happened at Mt. Gox.15 However, there have not been many publicly released audits of most major exchanges in the wake of Mt. Gox’s bankruptcy three years ago.16 Noteably, BTC-e publicly stated it would begin publicly publishing accounting statements certified by external auditors. It and its peers have not. About nine months has passed since the largest (as measured by USD) single successful attack took place on a cryptocurrency platform.17 Yet there are still many lingering questions. Thus the question, what happened to the promise of a public audit? Other questions that remain: as noted above, two of the ten biggest initial debt token (BFX) holders were employees. Why did Bitfinex redeem the BFX tokens after they knew USD withdrawals were shut down?19 How many insiders such as investors and employees owned that last batch of redemptions? What was the benefit of redeeming that last batch when they knew they were losing international wire capabilities? It appears after the hack that Bitfinex shifted assets from the Bitinex side of the books to the customer side. Who owned the bulk of both tokens, and what protection are these virtual assets given by not being on the company books? Or are they still on the books? 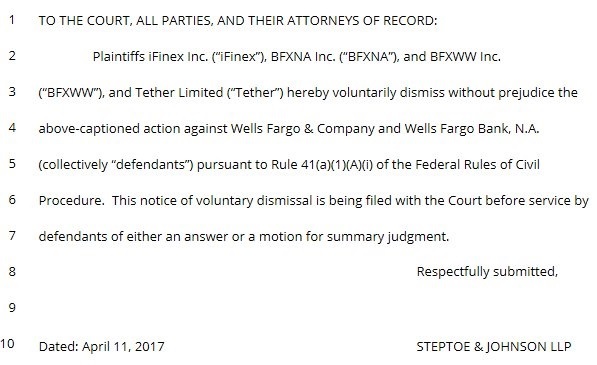 In terms of them redeeming after the withdrawals were ended, the original lawsuit documents lay out that as of March 31st, Bitfinex were actively emailing WellsFargo about the shutdown. The final BFX redemption was done a couple of days later and the lawsuit was filed shortly afterwards. It was roughly week later that Bitfinex informed the public about this international wire issue. And Tether did not formally announce the issues until a few days ago. Perhaps it is just miscommunication and only a matter of time before these questions are answered. Nearly two months ago, the SEC rejected a rule change for the COIN ETF to be listed on the BATS exchange. Last week, the SEC said it would review that ruling. First, the exchange must have surveillance-sharing agreements with significant markets for trading the underlying commodity or derivatives on that commodity. And second, those markets must be regulated. The Commission, however, does not believe that the record supports a finding that the Gemini Exchange is a “regulated market” comparable to a national securities exchange or to the futures exchanges that are associated with the underlying assets of the commodity – trust ETPs approved to date. It is unclear what will happen to Tether holders, if they will ever be made whole. Or what will happen to Bitfinex and future bank accounts. Or if the COIN ETF and other similar cryptocurrency-denominated ETF’s will be green-lit by securities regulators. Maybe these are all bumps in the road. (1) The Bitfinex hackers are still at large and no public post-mortem has been done to explain how it happened and what will be done to prevent future attacks. (2) The unilateral self-issuance of the BFX “cryptoequity” was not done in a fully transparent manner as some customers had bigger haircuts than others nor is it clear if the extinguishing of these BFX coins was done through the use of tethers. (4) That marketplaces such as Bitfinex — despite a general lack of transparency (where is the “About” page with executive bios?) — are still used as part of the weighting mechanisms in ETFs, including at one stage the Winkdex (which has since been deprecated) as well as the current Tradeblock XBX index used in a couple other proposed ETFs. As mentioned at the beginning of the post, the current trend over the past four years is that as Bitcoin intermediaries continue to operate as intermediaries and trusted third parties they increase their chances of regulatory scrutiny and oversight. Commerce on the Internet has come to rely almost exclusively on financial institutions serving as trusted third parties to process electronic payments. While the system works well enough for most transactions, it still suffers from the inherent weaknesses of the trust based model. Completely non-reversible transactions are not really possible, since financial institutions cannot avoid mediating disputes. The cost of mediation increases transaction costs, limiting the minimum practical transaction size and cutting off the possibility for small casual transactions, and there is a broader cost in the loss of ability to make non-reversible payments for non-reversible services. The Bitfinex hack that occurred in August 2016 created measurable amounts of new transactions costs that ended up being mediated through a wide array of social media channels; non-reversibility does not appear to have helped reduce these costs. For all of the “backed-by-maths” and “epistemological” talk about routing around trusted third parties, Bitfinex and its peers, still play a key role in providing continuous fiat <–> cryptocurrency liquidity to the marketplace. And as illustrated with the lawsuit above, by in large, these exchange platforms heavily depend on banking access moreso now than at any other time before. Last summer I proposed a Kimberley Process for Cryptocurrencies: in which market participants met with various regulatory stakeholders to iron out how to stop predators, remove encumbrances, and create best-practices for financial controls in this nascent space. For example, if Alice can cryptographically prove the chain-of-custody from her customer to her customers customer, then she may be able to comply with the banks surveillance requirements and maintain her bank accounts — and international wiring access — as she grows her remittance platform. There is a set of technology under development and in early pilots that enables authentication, provenance tracking, and document management and much of it involves digital signatures, standardized/mutualized KYC processes, and permissioned distributed ledgers. Documentation management, in this case, goes beyond just hashing and timestamping documents to include automatically updating legal agreements and contracts over their entire lifecycle. Whether these will be adopted by the cryptocurrency community is another matter, but these tools will soon exist in full production mode and could help provide better visibility, auditability, and transparency for investors, users, entrepreneurs, law enforcement, compliance teams, and regulators around the world. If you’re interested in learning more about these mechanisms, feel free to reach out or leave a comment below.